Tender diced potatoes, celery, onions and oyster mushrooms are combined together in this creamy and satisfying chowder. Canned oyster mushrooms can be found in Asian markets and are very inexpensive. In a large soup pot, melt the butter or margarine over medium heat. Add the onions and celery and sauté until the onions are translucent. Add the mushrooms and garlic and sauté an additional minute. Sprinkle in the flour and stir thoroughly to distribute. Slowly whisk in the broth. Add the potatoes, bay leaves and black pepper. 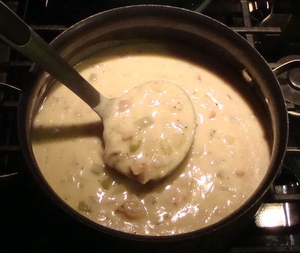 Bring the chowder to a simmer and then reduce heat to medium-low. Partially cover the pot and cook about 30 minutes, stirring occasionally, or until the potatoes are tender. Season with salt if needed and add additional pepper if desired. Stir in the heavy cream and cook and additional minute or two. Serve.